During the First World War the Austrians and the Italians fought over and inside Mount Lagazuoi in the Dolomites. 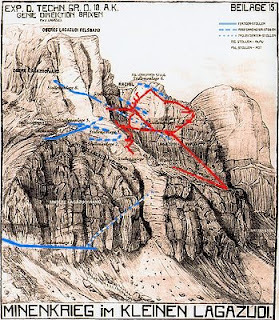 Both sides dug a network of tunnels inside the mountain with the aim of planting mines beneath their enemies. Some of the tunnels they dug have been restored and you can walk down inside the mountain through the tunnel system. 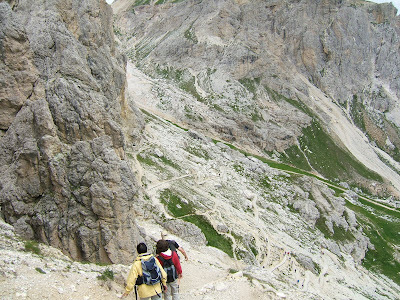 The route is recognised as a via ferrata. The journey will take 1-2 hours. Some people insist on walking up the tunnels, but this is just masochistic. 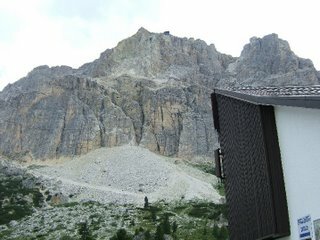 The journey starts with a cable ride from Passo Falzarego [west of Cortina] to the top of the mountain. Before setting off you should hire helmets and torches from a booth next to the cable car station. Both are essential. 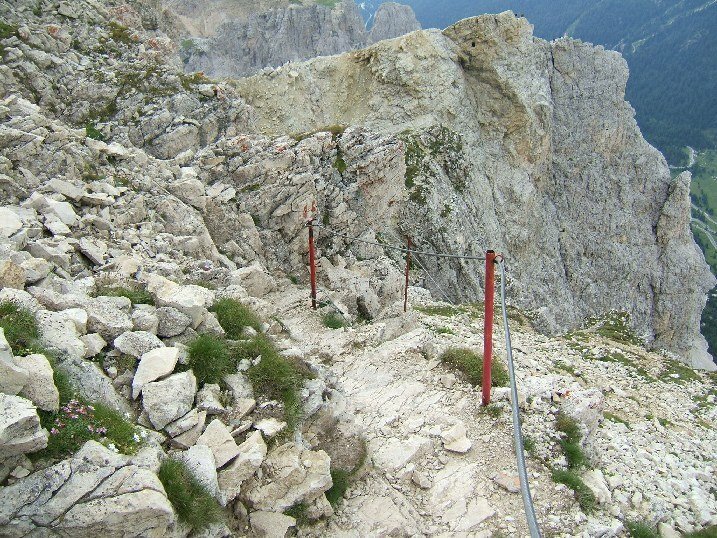 On the way up you will see the effects of the 33,000 kg of explosives the Italians detonated to try and blow the Austrians off the mountain. 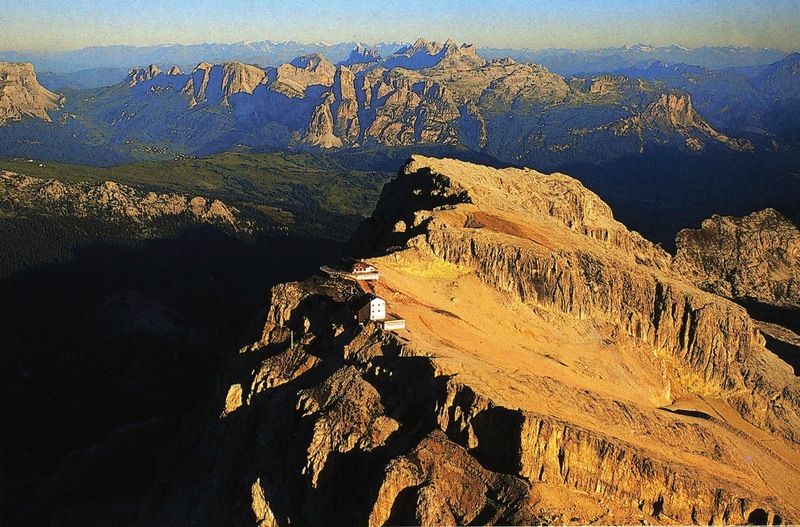 The refuge at the top of the cable car system is one of the best in the Dolomites. The restaurant is very good and the refuge is an excellent place to stay overnight. It has some nice 2 or 3 person rooms, and cheaper dormitory type accommodation. There are superb views over the Dolomites as the sun goes down. There are some nice walks nearby if you want to spend longer in the area. We left our car in the large car park next to the lift station, spent the night in the refuge and then walked down next morning. From the top cable car station you take an easy path down to the ridge in the photograph. The tunnel entrance is at the end of the ridge. The path to the mouth of the tunnel is much easier than it looks. 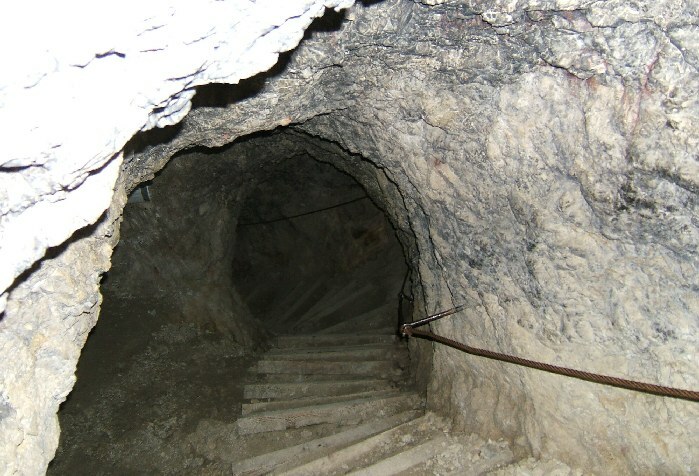 The entrance to the tunnel is at the end of the ridge. Looking back at the cable car station. On the way down the tunnels there are lots of side galleries and features to explore. Looking through a tunnel 'window' at Passo Falzarego, the lift base station and the car park. The tunnel exits part way down the mountain, and you then follow paths 402 and 20 back to the pass. The 402 and 20 paths are steep and uneven. I found a walking pole useful for keeping my balance. The booth by the foot of the cable car sells a nice print of the tunnel system inside the mountain. I have a framed copy on my wall. 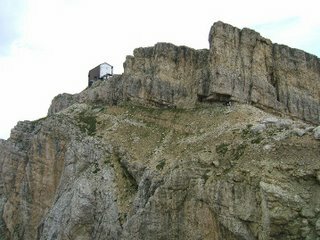 They also sell "The Great War on the Little Lagazuoi" which covers all the military actions in the area, including those around the fort at Tre Sassi. There are two other WW1 tunnel systems nearby. The first is Galleria del Castelletto which is eastwards along the mountain side from Lagazuoi. 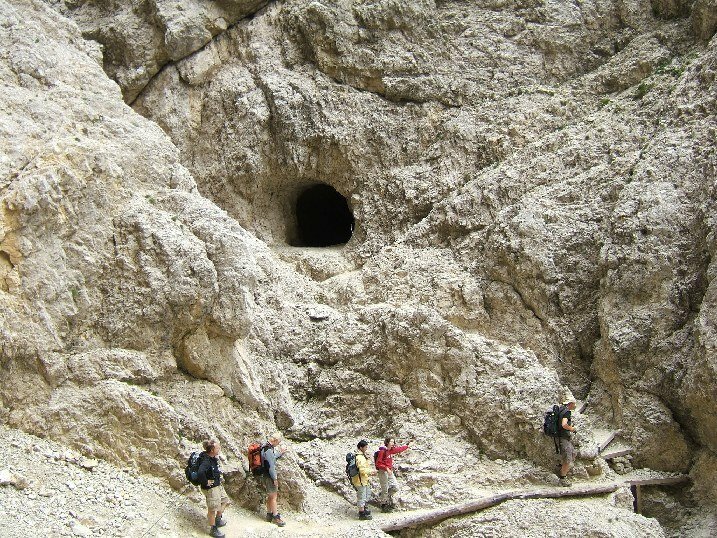 This tunnel is 500m long and is accessed by a path from Refuge I. Dibona. 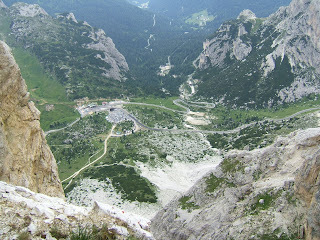 The Galleria leads through the mountain to the Via Ferrata Giovanni Lipella. The other is the Goiginger Tunnel in Sasso di Stria. This was an Austrian tunnel. It can be reached from the ruined fort at nearby Valparola Pass. 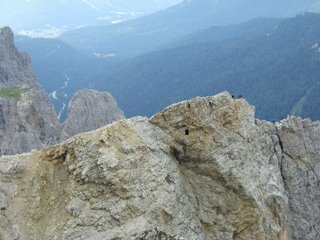 There is a large open air WW1 museum [trenches etc] nearby at Tre Cima. 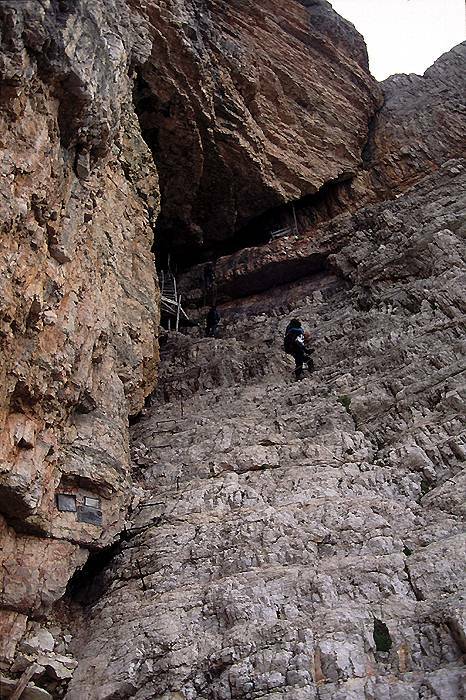 We've just returned from Italy where we enjoyed several via ferratas, one of which was the Ferrata Lagazuoi Tunnels. While I can appreciate the author's comment that going through the tunnels is "just masochistic", I must share with readers that I am a novice and, while I found the route challenging, I believe I would have done myself a great disservice had I not approached the summit via this route. Going through the tunnels gives the hiker a sense of what the Italians and Austrians went through during this difficult time in history... the damp air, the vantage points (windows) they peered from, and the difficulty navigating through the tunnels. Well, as another amateur, I attempted the downward descent through the tunnels last week. It was more difficult than anyone reveals and, quite frankly, an awful experience. Don't attempt this without, at least, a good degree of fitness and walking experience. The worst day of my life. It is not an easy walk either way, but having just ascended the route and thoroughly explored all of the extension tunnels on the way I reckon it is easier and safer to ascend rather than trying to descend the large slippery steps in the semi darkness. And what a sense of achievement to arrive on top of the mountain to the most stunning of views as you exit the tunnel. a few more minutes and you will be at the refuge to enjoy a well deserved drink. Either use the cable car down or enjoy the walk and views on the way down. If you want a real challenge try the Austrian troop path down but best have some VF kit with you for the tricky bits. Not a route to take your granny on!